This is a Lindsay Limited Edition Water Colour PRINT of Rita Lee who was Norman’s favourite model after Rose. 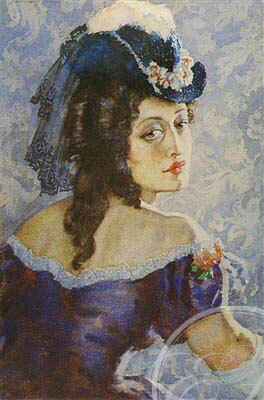 Rita of the Eighties is the only known watercolour portrait Norman Lindsay painted of her. The amethyst purple and pink tones combine to convey the aura of serenity which Rita possessed and the touches of white on the feathered hat, lace trim and glove add to the delicacy of the picture. It is without doubt one of Norman’s most beautiful watercolour portraits.